Perfect alone, as an appetizer or as a snack, in combination with fruits, nuts, honey and irreplaceable to enrich and boost Italian traditional dishes. The Grana Padano, refined by Cantarelli in the maturation warehouses in Sant’Ilario d’Enza, comes from the Pianura Padana regions, on the left side of the Po River. 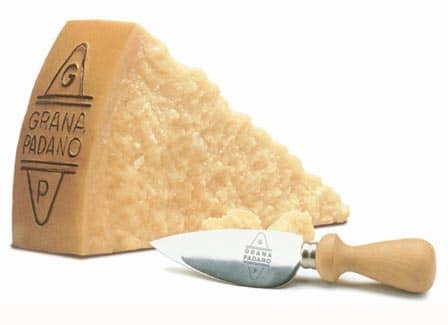 Grana Padano is at least 18 months matured and it is marketed in aluminum-vacuumed packages. Wedges: 250/280 gr / 550/600 gr /1000 gr / heart 1000gr, quarts 4000 gr / whole wheels also available.